The Lions Youth Camp & Exchange Program (YCE) gives thousands of young people the opportunity to experience life in other cultures and gain new understanding of the world through traveling abroad. This program does not involve academic study or employment. Instead participants are encouraged to use this travel opportunity to represent their home countries and share their own culture while learning about and embracing a new one, forging the way to becoming young ambassadors for peace and international understanding. 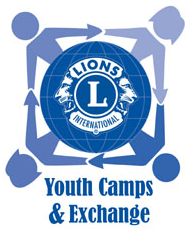 YCE is composed of various Lions Youth Exchanges and/or Lions Youth Camps arranged by Lions clubs around the world. A Lions Club Youth Exchange, or “host family stay”, can be arranged independent of a Lions youth camp in hundreds of countries where there are Lions clubs and typically lasts between four and six weeks. Lions Youth Camps are one or two weeks long and usually include a host family stay before and/or after the camp. Activities for both exchanges and camps can include visits to places of cultural or natural interest, sporting events, country presentations by participants, guided discussion, and even engagement in local service projects alongside Lions club members. To learn more about this exciting program, please visit their web site.